In 2010, a physician told him to buy a funeral plot, because he would need it in five years. He was 51 years old. So he went to talk with a naturopathic doctor about losing weight. She said: Get a shelter dog. O'Grey was surprised, but he took that advice, heading to the Humane Society Silicon Valley near his home in San Jose, Calif. He told the shelter, "I want an obese middle-aged dog, like me." That's how he met Peety. Their story might have ended there. But Carol Novello, president of the Humane Society Silicon Valley, had been trying to make the point that helping animals improves the lives of humans, too. She was finding that a tough sell, so she started looking for stories that made the case. "A while ago, Eric O'Grey submitted his story, and I just loved it." I know our shelter kitties make my family happier, even though they haven't helped me lose weight. And watching the Eric and Peety video has to be good for my heart, though it makes me reach for the tissues every time. "He transformed me into a completely different person," O'Grey says in the video. 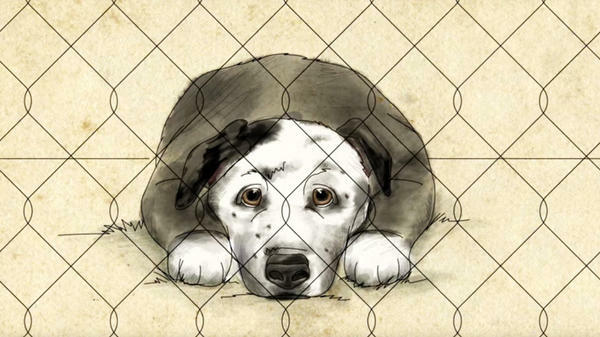 "I think about it now: Who rescued whom? Did I rescue him, or did he rescue me?"